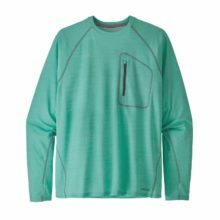 The 2.5 layer nylon Patagonia Men’s Torrentshell Jacket wields Patagonia’s H2No Performance Standard protection technology that’s durable, lightweight and versatile. The Torrentshell has a waterproof, breathable barrier, a Durable Water Repellant finish, and can be folded into one of two zippered hand warmer pockets. The 2-way-adjustable hood rolls down, stows away and has a laminated visor, the center zipper has minimal welt exterior and interior storm flaps, and the ventilating pit-zips have storm flaps and DWR-treated zippers.